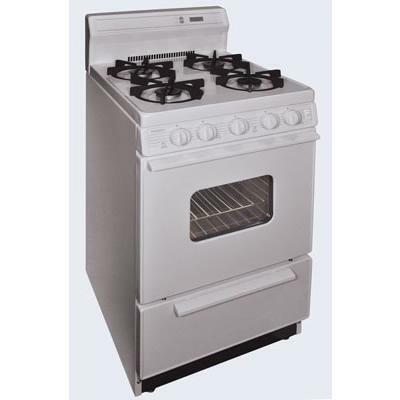 Premier 20 inches gas range with 8.5 porcelain backguard and clock. Electronic ignition range with Hot-surface oven ignition & Recessed Design helps keep spills in place. Additional Information Heavy duty continuous cast iron grates; Easy access, roll-out drop door broiler with smokeless, porcelain 2 piece pan & tray; Fully insulated oven saves energy & provides better baking results. Warranty 1 Year. lifetime on burners.